Rumor has it that when you send a text message to a certain email address, a dark angel will appear and grant you one wish. 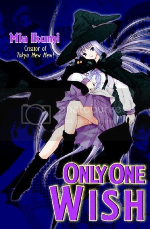 Only One Wish is a series of short stories about young girls who email the dark angel and then get their wish granted. Their wishes range from hooking up with a cute guy, to seeking revenge on someone they don’t like, to even bringing the dead back to life. But like most stories of this kind, the girls learn very quickly that the wish does not turn out quite as planned. Only One Wish comes from Mia Ikumi, the artist behind the popular Tokyo Mew Mew magical girl series. But like Mew Mew, this series suffers from some serious issues that prevents it from being enjoyable. I normally have a policy with this blog to only review the first volume of any manga or anime I receive from the companies. The reason for this is mostly because I don’t want to repeat the same rhetoric for a particular series volume after volume. But I also do this so that I don’t end up reading a later volume of a series without ever reading a previous volume. That way, if I don’t like the series, no one can give me “well, that’s because you didn’t read the first part” as an excuse. So when Del Rey sent me the second volume of Yokaiden for review, I faced a dilemma. The buzz over this title and its artist, Nina Matsumoto, had been extremely high, so I was really interested in checking it out. Web comic artist Matsumoto practically exploded on to the scene when a manga-style drawing she did of the Simpsons made its way around the internets. She landed two key gigs from this drawing. The first was for the official Simpsons comic book where she penned a “Treehouse of Terror” special that parodied Death Note with Simpsons characters. The story, “Murder, He Wrote,” won her a coveted Einser award at the last San Diego Comic Con, which is quite impressive for a 24-year-old during her first year as a professional artist. 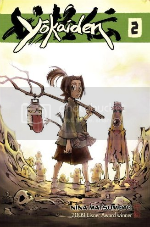 The other gig she got from the internet exposure was this OEL series from Del Rey, which too has received very high reviews from the manga community when the first volume came out last year. So I decided to give in to the hype and dive into the second volume from this award-winning artist. After all, I did the same thing when I reviewed Black Jack vol. 5 earlier this year without reading the earlier volumes, and I still enjoyed that series. But unfortunately, it just didn’t work out that way for me this time. I just couldn’t get into Yokaiden no matter how much I wanted to. The Lizard Prince tells the story of Canary, a young princess who has been betrothed to Heath, the prince of a nearby kingdom. But Heath is a real jerk, and he has no desire to wed the girl. So he conjures up a plan to mess with the girl’s head. Heath has a pet talking lizard. With a little bit of magic, he switches bodies with the reptile and then forces his pet to go on a date with the girl in his place. But it turns out that the lizard was quite the gentlemen, and Canary ends up falling head over heels for him on their first date. The prince is royally pissed that his mean plan did not work out, so he decides to take matters in his own hands and expose the princess to what was really happening. How will Canary react when she finds out her true love was really a lizard? 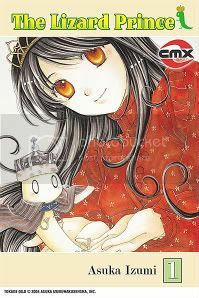 This is CMX’s second shojo release from Asuka Izumi after her manga adaptation of Ballad of a Shinigami last June. When I reviewed that title, I really enjoyed her storytelling and her surprising conclusions, so I am happy to report that she hits yet another home run with this fairy tale story. Based off of the classic arcade game from Bandai-Namco, Tower of Druaga: The Aegis of Uruk is the tale of wannabe hero Jil. Sixty years after the Tower of Druaga was defeated, it has once again returned to the Uruk Kingdom. But fortunately for the people of Uruk, the Summer of Anu approaches, which subdues the monsters living in the tower enough to give the villagers a fighting chance to enter and climb its many levels. While most of the folks who venture into the tower merely wish to take the treasure hidden within it, Jil has much bigger plans in mind. He wants to reach the top level and beat the evil Druaga himself. But his first guild fires him after he nearly gets them all killed in the lower levels. So he gathers another colorful band of warriors, mages, and other characters you’d expect from a typical fantasy story, and ventures on into battle. If you remember a few weeks ago, I reviewed Blassreiter, one of the first anime series legally simulcasted on the internet while airing on Japanese TV 20 months ago. 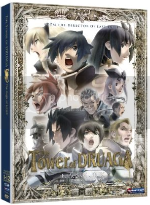 Well, Druaga was the other simulcast that aired that season, and just like Blassreiter, I absolutely loved watching this series on a 2-disc DVD box set from FUNimation. Watch out, America, there’s a new manga company in town. Kodansha is the largest publisher in Japan and puts out some of the country’s most popular manga magazines like Morning, Nakayoshi, and Weekly Shonen Magazine. They shook up the American manga industry five years ago by going into an exclusive partnership with Random House to create Del Rey Manga. Thanks to Kodansha’s amazing catalog of works from artists like CLAMP and Ken Akamatsu, Del Rey entered the market with a bang, and is now considered to be the second largest manga publisher in America. But over a year ago, rumors began circulating that Kodansha was going to be setting up their own manga division in America that would run separately from Del Rey. Personally, I’m cautious whenever something like this happens. When Toei Animation and Bandai Visual decided to bypass their American partners and enter into the domestic anime market themselves, it was disastrous. So, I was worried that a “Kodansha USA” would meet a similar fate in the manga world. Well, the rumors turned out to be true, and the new domestic manga publisher, now officially called Kodansha Comics, released their first two manga volumes last month. They were Akira and The Ghost in the Shell, both originally released in America by Dark Horse Comics many years ago. So considering that I have no idea who is running the new company or if they even had a PR department, you can imagine my surprise to see these two books magically arrive in my mailbox last week for review. And being that I’ve never read either of these series from Dark Horse in the past, I decided to see what this new publisher was all about with their first volume of The Ghost in the Shell manga by Masamune Shirow.